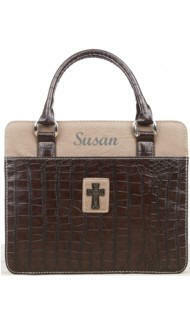 A selection of Bible covers available in many color styles and various sizes. Each Bible cover has a carrying handle, an outside zippered pocket, an inside ribbon bookmark, and a loop to hold your pen inside the Bible cover. We personalize on the front cover with embroidery of a name, initials or a monogram for a personalized cover to store your Bible. Cover sizes are shown below. Bible covers are only available in the sizes shown. 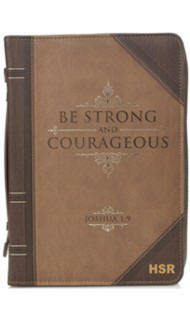 The "Be Strong & Courageous" Bible Cover has the look and feel of an antique book. The front carries text from Joshua 1:9, and the complete verse is skillfully debossed into the back. 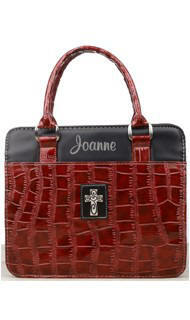 You're look fasionable carrying this patent leather look style purse Bible cover. Save yourself the trouble of having to carry both a purse and Bible to service. 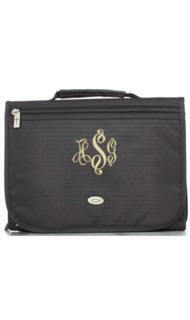 It is decorated with a silver cross on the front and we monogram using a laser foil with a first name. Elegant Bible cover looks and carries like a purse. Fits a Bible or book up to 6 3/8 x 9 1/2 x 2 in. Inside there is a zippered mesh interior pocket and three interior photo holders. There is also a pen loop. The front pocket has a decorative silver cross. Zippered closure. We personalize using a silver laser foil for a first name. 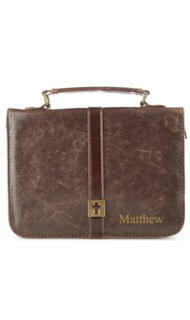 The Bible cover is constructed of quality man-made material with the look and feel of real leather. There is an exterior zipper with a cross engraved zipper-pull, an exterior slip pocket on the back and a suitcase style handle. 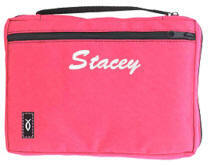 Inside, a zipped mesh pocket and pen loop offer extra functionality. Holds Bibles up to 9.50 x 6.75 x 2.25 inches. This sturdy polyester body is woven in a checked design, with a decorative metal fish accent and cross engraved zipper pulls. You will be able to store all of your study needs in this Three Fold Bible Cover Organizer.